Oliver has a special surprise for one medium-sized Fido. Four booties (2 back and 2 front) are teamed up with a sample from Canine Earth: Wash and Wag Oatmeal and Aloe Natural Shampoo, and a container of USDA Organic Awesome Apple Paw Balm. So, we're sending out this call to pups in cooler climates. Take care of your Fido's feet with this kit, created just for one medium-sized dog. 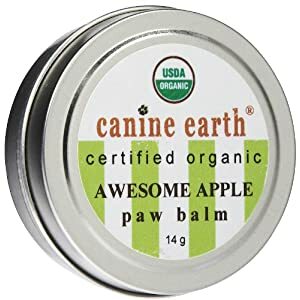 If you'd simply like to try the Canine Earth products, follow the links above to Amazon for a quick and painless purchase. Yesterday when the weather turned a bit chilly here in Florida, Oliver snuggled up to this prize for a photo. "No, Oliver, you won't need booties. Besides, they're too big for you." These boots will go to a pup that's a medium-sized dog and lives in a colder climate. If you'd like to see a photo of Oliver in his cute new jammies, check 5 Minutes for Fido. If you'd like to enter, please understand that I cannot replace the booties if they do not fit your dog. Perhaps you can donate them, give them to a friend, or take them to a local rescue or shelter. Please enter this giveaway only if you you have a medium-sized dog. My guess is they will fit a dog that is at least 20-25 lbs. and probably up to 30 or 35 lbs. I suppose it will depend on the breed, but that's my best guess. No guarantees! Full disclosure: These products were given to me in conference swag bags. I am under no obligation to give them away or write about them. There is no purchase necessary to win this giveaway. Please consult my Giveaway and Contest Rules for more information. Aww very cute and useful! Very useful for pups here in Pennsylvania! oh yes! Fleece booties & shampoo is defiantly what Bentley needs. He's running low on shampoo. Bentley is a Shih Tzu who weights ~14 lbs. Last year was his first experience with snow and it was too funny! He's so furry that all the snow was sticking to him. I'm thinking he doesn't mind it. Coco is a 30 pound cocker spaniel. She loves to play in the snow. If I'd let her she would stay out in the snow all day! I think these would fit Midget. I'm not sure what her breed is. My best guess would be a cattle dog mix. I honestly have no idea how much she is in the snow! We found her this past Spring and it had only snowed once before I left for Florida. We will see in the next couple of months. She's 25 lbs. Golden retriever 74lbs. Loves playing in the snow. My friend has a Boston Terrier, not sure of the weight. I think he does enjoy playing and walking in snow and ice.